the age of seven and has since become recognised as one of Australia’s leading young guitarists. A first class double Honours graduate from the Elder Conservatorium, she is currently completing a Master of Music performance on a full scholarship. The music of this multi-award winning player has been heard in festivals throughout Australia and overseas; before 21 years of age, Jody had already performed solo recitals in venues such as Wienklang (Berlin), Eschen Convention Centre (Liechtenstein), as well as across Australia and locally in The Adelaide Festival Centre, Elder Hall and SANTOS stadium. She has been a part of the Adelaide Festival Centre’s Sunday Spectrum, Elder Hall and the Elder Conservatorium’s Lunch Hour, Evening Concert and Emerging artist Spring Concert Series. 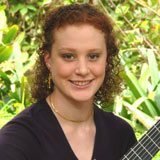 As an undergraduate, Jody was the first guitarist in the history of Elder Conservatorium to perform as a soloist with the orchestra and, in 2010, was a featured soloist with the Melbourne Musicians and at the Adelaide International Guitar Festival, where her uniquely lyrical playing was acclaimed for its “clarity… full tone and [evincing] a clear understanding of the music”. Jody has also performed with acclaimed Australian musicians including guitarist Dr. Jonathan Paget and pianist Benjamin Martin. This year, Jody has been invited to Italy to further her career with guitar maestro Eduardo Fernandez. As well as performing in concert, Jody has provided entertainment at major charity events such as the Cancer Council’s Relay for Life and Catherine House’s VIP Silent Auction. She has been broadcast on MBS and the ABC, most recently performing for the TV show Q&A. Scholarships include the prestigious Dame Ruby Litchfield Award for Performing Arts, a Director’s Award from the Elder Conservatorium, multiple prizes from Recitals Australia, the Michael Robert Poag Scholarship for guitar (two-time recipient), Allan’s Music recital prize, Helpmann Academy Optus Mentorship and, most recently, nomination for a Channel 9 Young Achiever Award (Arts).